Hello Friends. Are you enjoying the Summer heat? My family and I love Summer weather. My children are like fish and love being in the water. We have been to the beach every weekend and will continue to do so until it gets too cold. What about you? How are you spending your August? 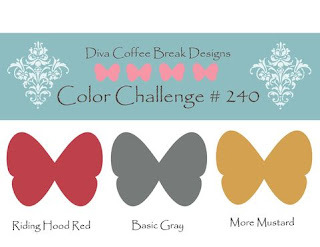 This week we bring you a color challenge. What do these colors inspire you to create? Here are the Divas Inspiration shares.